T he Clackamas County Fair and Rodeo wrapped up this past week down in Canby, and whether you're a city dweller or country folk, everyone can agree that there's something nostalgic about the annual celebration of the people and communities that make Clackamas County a great place to live, work and play. 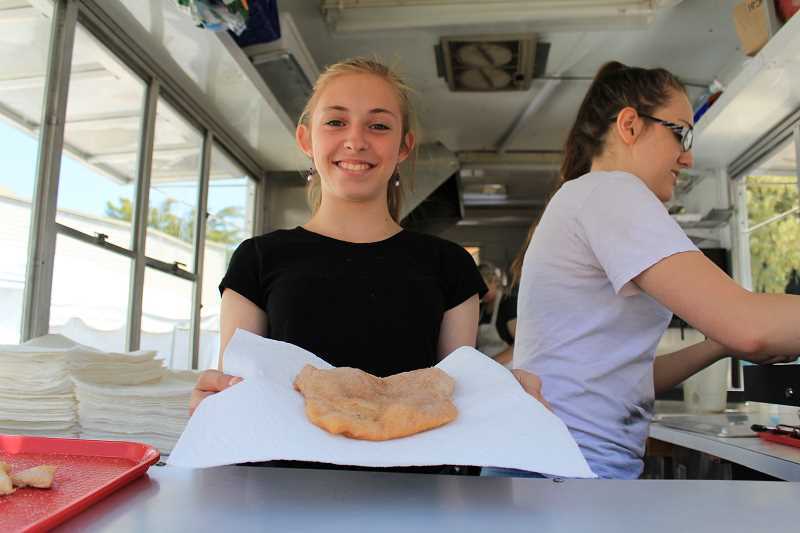 Between all the 4-H exhibits, demonstrations, musical performances and the rodeo, there's so much to see and do at the Clackamas County Fair that it's hard to fit everything in. If you're like me, one of the activities that takes precedent is indulging in all the amazing food choices available to fair-goers throughout the week. Deep fried, battered, slathered in whipped cream, drowning in barbecue sauce — simply walking through the food court is enough to make you have a coronary event. But the county fair isn't an occasion to be picky about healthy options or worry about cholesterol. Don't get me wrong, being mindful of your nutrition is a smart life decision — one that I've only recently learned to make as I've grown into adulthood — but the county fair is neither the time nor place to count calories. The annual county fair is a time to satiate those sweet-tooth cravings you've had since you were a child, or to satisfy a yearning for the more savory flavors you've come to know and love as an adult. This year I decided to attend the Clackamas County Fair with one goal in mind: to fill myself with carbohydrates and not feel an ounce of guilt. Over the course of two days at the festival I tried seven different vendors — including hot dogs, pulled pork, funnel cake, elephant ears, burritos and hand-squeezed lemonade. I decided to start off with savory because what kind of animal eats dessert first, right? I was torn between a hot dog and a pulled pork sandwich so I went ahead and got both. 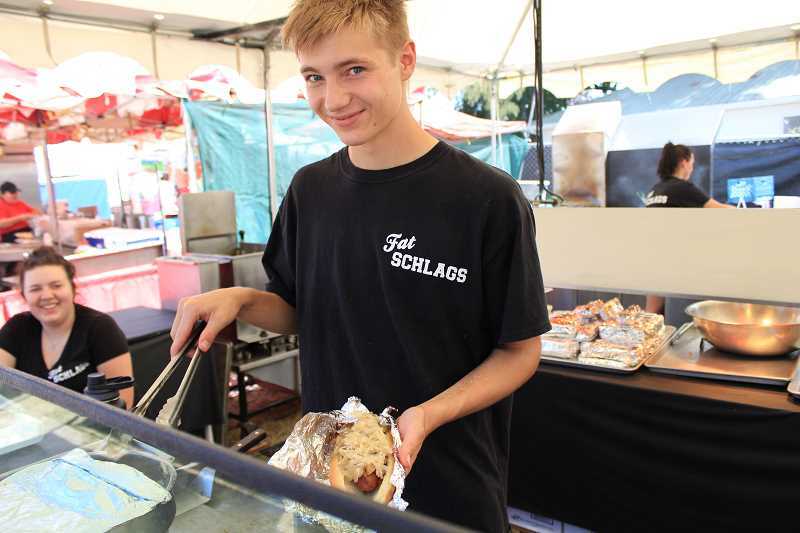 I began with the hot dog, courtesy of a charming little vendor aptly named "Fat Schlags" out of Keizer. A Fat Schlag runs you $7 and is basically a giant sausage in a white bun absolutely covered in sauerkraut and sauteed mushrooms. The smokiness of the sausage really complemented the kraut and mushroom combination, which I'd usually opt out of when in a bun — can you say, "soggy"? — but Fat Schlags kraut seemed less runny and messy than some kraut dogs I've had fairs or festivals. This sausage really blew away my expectations. If I hadn't already planned on getting a pulled pork sandwich, I'd probably have done two because one was simply not enough. After I destroyed my offering from Fat Schlags, I sauntered down the row to Johnny C's Kitchen out of Salem. To be honest, I knew I'd be stopping at this booth before I even saw it because I could smell the smoker from the front entrance of the fair, and I always follow my nose. For $9 I got a decent-size pulled pork sandwich loaded with slaw. My eyes might have been a little bigger than my stomach, but with enough barbecue sauce I can put any amount of pulled pork down. What I really appreciated about this sandwich was they paid attention to their slaw, which in my opinion can make or break a pulled pork sandwich. If you've got day-old slaw on a really great pulled pork, it ruins the experience. If you're like me, you put the slaw inside the sandwich, the way God intended it to be, and dig in. Johnny C's did it right; cold and crisp, freshly diced cabbage and carrots, not too much mayo, not too sweet. It really pulled the whole ensemble together, and my only complaint about the experiences is that I couldn't find the hot sauce. Now that I'd been properly gratified my need for savory, I decided to take a quick lap around the fair to let my food settle before digging into the sweets and to take a look at all the cool 4-H projects and entertainment acts happening for the day. Having reported at a small community newspaper in rural Indiana for two years, 4-H is actually pretty exciting to me. There's nothing like watching a kid who has raised an animal for one, two, three, maybe four years with love and care win a blue ribbon for their efforts. Although I never personally participated in programs like 4-H, I think they're incredibly valuable to kids looking to build their resume with activities that show responsibility, determination, hard work and leadership. I spent a few minutes watching some young girls show their rabbits in the agility competition before going to take a look at some of my favorite animals, the llamas and alpacas. It's pretty cool to see how impeccably groomed these animals are and how much care is put into their well-being on behalf of these kids. After a pleasant conversation with a 4-H mom about backpacking portions of the Pacific Crest Trail with the aid of llamas, I decided it was time to return to the food court to commit more treasonous acts against my body. This time I was in search of a sugar high, and I figured there was no better way to chase that high than with a massive funnel cake topped with marionberries and whipped cream. For $9.50, I was swimming in a pool of creamy, berry goodness with that perfect amount of crunch in the fried batter at the bottom. It was a tough choice not to go with apple on the funnel cake considering it's such a classic, but no native Oregonian can turn down blackberries in the summer. It also seemed appropriate, considering the Clackamas County Fair's agricultural extension partner is Oregon State University, the institution behind the breeding of the sacred marionberry strain. Despite being a graduate of the University of Oregon and devoted Duck, I can appreciate how iconic these berries are to our state and the great work done at OSU around agricultural research. After I reached the bottom of my funnel cake I decided to try one more vendor, Doughboys Elephant Ears of Oregon City. Some people prefer one or the other, elephant ears or funnel cake, but I like to think that there's room enough in my unsophisticated palate that I can love these two items equally. While funnel cake is great for its fruity and creamy flavor profile, the elephant ear is a simpler, yet timeless classic combining that soft fried dough mouth feel with the spice and splendor of cinnamon sugar. Doughboys offered two sizes, a "personal" version that looked like it could feed a family of four, and "grande" size that seemed fit for a football team. For just $6, the personal elephant ear is an unbeatable value for sweet treats at the fair, and it only took me about 15 minutes before I realized I was in over my head. After a Fat Schlag, pulled pork sandwich, funnel cake and an elephant ear, I was finally defeated and forced to walk away from a 4-square-inch section of cinnamon-laden dough. I never knew that defeat could taste so good.